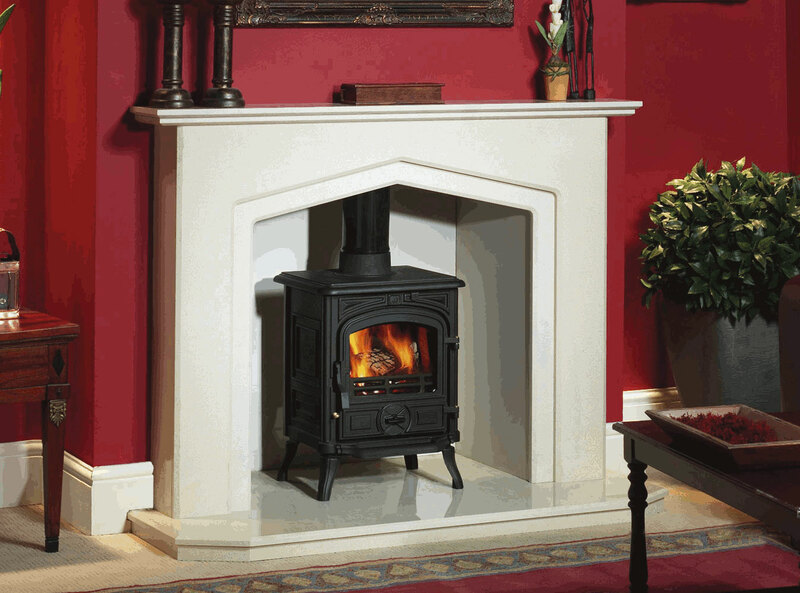 The Franco Belge Belfort stove is a compact model and will therefore be able to fit into smaller fire place settings. It has a 5kw output & you do not need to put an air vent into the room as less than 5kw output. 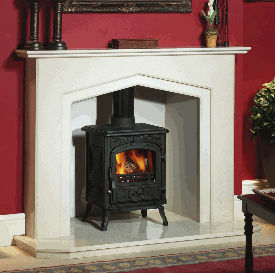 You can get the Belfort stove in enamel finish as well. There is 1 plain door with a glass panel on the stove and the flue pipe can come out of the top or back of the stove. Stove expert replied: The smell is likely to be something to do with the installation, more than likely flue originated. Has the flue been lined and backfilled with suitable insulation? Is any part of it close to any combustible materials? Does the smell happen just on lighting or only when the stove and flue are hot with an established fire? The stove is a metal box, where can a smell be generated from once the paint has cured? There have been known cases where the stove paint itself does not cure fully (not specifically with this brand though) and an acrid smell can result. You could rub the stove down and respray with suitable paint or go back to the supplier who in turn should contact the Franco Belge importer. Stove expert replied: There are several spare part outlets which may be able to assist but should the part not be available any longer it is unlikely that it can be refurbished using non genuine spares. Stove expert replied: The manual states: Figure 7 The closing latch rotates around a pressure screw positioned cam. - Loosen pressure screw 1. - Turn cam to desired position 2. Tighten pressure screw 1. In the manual it appears that the hinge pin can be knocked out so that the door can be lifted off the stove, a two handed job or rather two person may be better. Please refer to the manual for available replacement parts that may solve the locking problem. Stove expert replied: Have you tried using something like a releasing spray on the ceased part? You may be able to get the grub screw / pin drilled out and get a replacement if the spray does not work. A little heat can also improve the chances of moving a stuck screw sometimes. Stove expert replied: Gas Safe Engineers will need to undertake the annual servicing and the thermocouples are the parts that normally require replacing as they deteriorate through wear. If the stove is cutting out, even after replacement, it could be due to the safety cut out being activated and the reason for this needs further investigation. It could possibly be due to the flue gases not getting away from the stove fast enough, possible cause down draught but gas stove are not something I have a great knowledge of. My Belfort is now in its 4th winter. It is very well built. The air control is excellent and it is great to use. My friend has had one of these for ten years, it is a fantastic stove. Burns well, but stinks the house out. Stove expert replied: Any smell that comes from a stove can only be from the heat it generates and initially it will be the paint curing. After the first few firings any smell will be down to the installation or fuel used. It may be that something is close to the flue in the chimney that is the cause. The stove in essence is a cast iron box so there is nothing that can cause a prolonged smell. We''ve used this burner about a dozen times...and it still smells the house out. I''ve been told that the paint needs to cure then it''ll stop...how much longer will it take..
Stove expert replied: Normally the paint curing smell lasts for just a few firings. I suggest that if the smell persists, get the installation checked to insure that there is nothing close causing the smell. The stove paint cures and hardens with heat and the smell should not persist. Stove expert replied: The paint will cure usually after a few firings, gently increasing the heat to an average working temperature. If the smell persists do look further than the stove as there may be something in the flue installation that is causing a smell, very unusual for a prolonged smell so worth getting checked out. Stove expert replied: Anthracite is one of the hotter smokeless fuels on the market. There are many alternatives which may be considered for the future use of this stove. The internal parts, depending on how hard you are firing the stove and on how much fuel you are putting in the firebox, can be exposed to very high temperatures, so controlling the rate of burn and amount of fuel is critical.